Briefer than Literal Statement: Cambridge revisited. I know that people do sometimes read this blog, because Google gives me the stats, although I don't know if it's different people or sometimes the same people and if they come here looking for something completely different and click straight off again, so it seems silly to talk as if earlier posts have been seen. 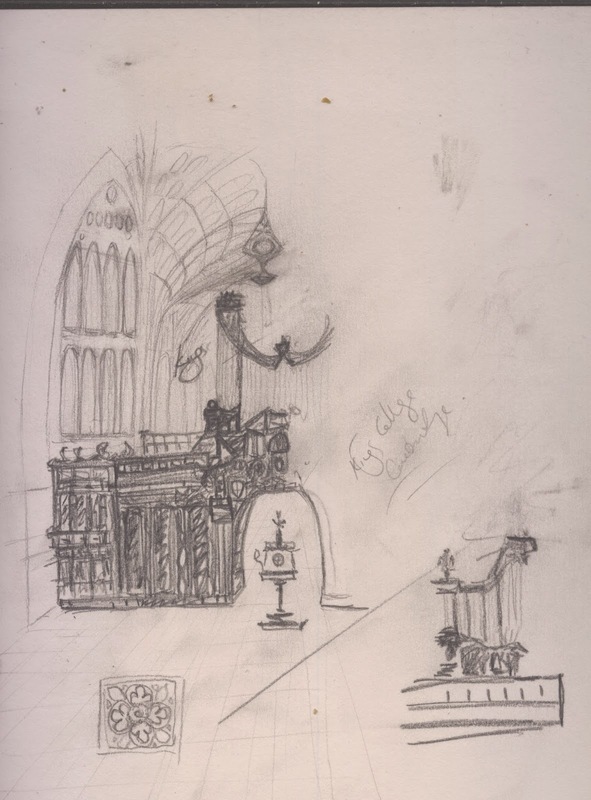 However if anyone is reading regularly they will know I went to Cambridge in the Summer and completely failed to draw the Organ in Kings College Chapel and then completely failed to draw something else more recently and resolved to practice. I have been practicing - although not as much as I promised myself - and now I've tidied up my original sketch and am much happier with it I thought I'd post it. The perspective is still slightly off and how much it still resembles King College Chapel I'm not sure, but I do know the lectern is correct. That was the only bit I was pleased with at the time.